into the African jungle to celebrate a century of Tarzan. Astoundingly, Tarzan is 100 years old. The man who represents youth and vigour made his entree in the October 1912 issue American pulp magazine The All-Story. The "ape-man" would transpire to be one of the most famous fantasy icons of the modern age. He was the invention of Edgar Rice Burroughs. A Chicagoan born in 1875, Burroughs had tried a dizzying variety of professions before making his literary debut with his interplanetary fantasy Under the Moons of Mars. Tarzan of the Apes, his second published piece of prose, was a story with roots in several places: the Romulus and Remus myth, true-life feral children and various fictional antecedents, particulary Kipling's The Jungle Book. Above all, though, it sprang from Burroughs's rather snobby mindset. A man who prided himself on his almost unadulterated English bloodline and an adherent of the dodgy science of eugenics, he believed in nature over nurture. A nobleman, he surmised, would retain the intellect and moral grace bequeathed by his refined lineage despite being brought up by savage beasts. Accordingly, he spun the tale of John Clayton, orphaned English Lord Greystoke, who after a ship's mutiny and the death of his parents was brought up in an African jungle by the Mangani, an undiscovered and ferocious form of great ape. The latter called him Tarzan, meaning "white skin" in their language. Though the boy would swing in the treetops with his hairy tribe and converse in their guttural speech, he became cognisant of his difference via the primers and books in his parents' abandoned log cabin. The same place yielded up his father's hunting knife, which both enabled him to shave and put him on an equal footing with Bolgani (gorillas) and Numa (lions). Tarzan grew to manhood and became king of his tribe by vanquishing the bullying Kerchak in blood-drenched combat, but when Miss Jane Porter of Baltimore entered his life, he discovered a more tender side. Ultimately, she became his wife as he reclaimed his birthright in civilisation while maintaining one foot in the savage land he had conquered. Though Burroughs would write 80-odd books encompassing the entire range of literary styles, Tarzan would always remain his biggest money-spinner. This obliged him to perpetuate his adventures regardless of his own preference. When preparing the eighth of his two-dozen Tarzan volumes (almost all of which were serialised in magazines first), Burroughs confessed in correspondence that "for the last few years it has been a case of rearranging and camouflaging threadbare situations." 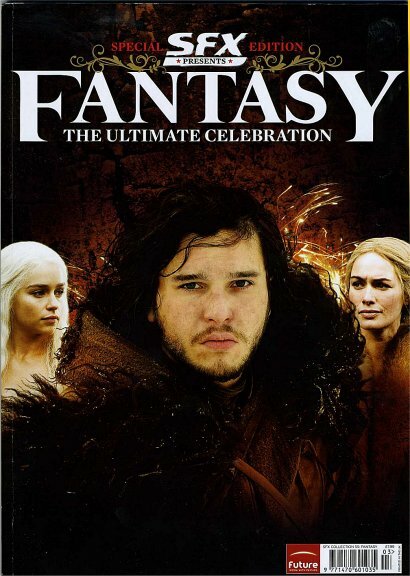 Yet the author frequently grabbed inspiration from the jaws of such lethargy. The Son of Tarzan was a charming retelling of the Tarzan legend that introduced us to his similarly savage boy Korak. Jungle Tales of Tarzan was a delightful Jungle Book-like series of interconnected stories focusing on Tarzan's teenage years. 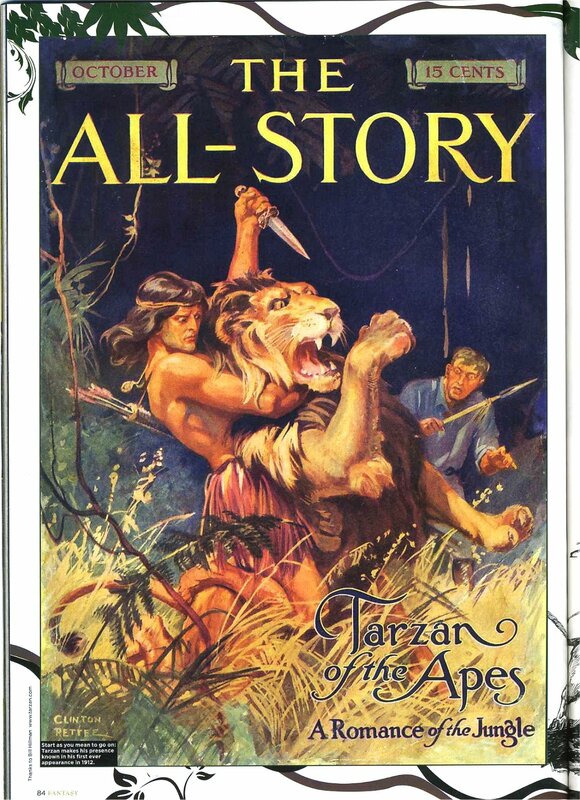 The thrilling and brooding World War I-set Tarzan the Untamed, saw the ape-man go berserk after coming to believe Jane had been murdered by the Hun. Tarzan was always a fantasy figure. No child who has not heard human speech would be able to develop into the articulate man Tarzan was, while the ape-man's frequently mentioned preternatural beauty ("His face was very handsome -- the handsomest, thought D'Arnot that he had ever seen") was not of this world. However, Burroughs took the series more and more into the realms of speculative fiction, principally via Tarzan's habitual discovery of hidden outposts of ancient civilisations. The latter was a transparent tactic to get around the fact that there were only so many battles Tarzan could fight with lions and crocodiles. Though their number became ever more preposterous, Burroughs's lost cities were ingenious in their minutely detailed histories, customs and languages. Opar, treasure-bedecked but bestial, was the first. Over time, ERB would also give us the Lilliput-like Minuni; a "London" twin inhabited by genetically-modified regal gorillas; Castrum Mare and Castra Sanguinarius, forgotten settlements of the Roman Empire where gladiatorial battles were still in vogue; and Pal-ul-don, inhabited by prehistoric monsters and two warring species of men with tails. Tarzan also paid a visit to the world at the earth's core from Burroughs's Pellucidar series. Moreover, it transpired that if he looked after himself, Tarzan could live forever. In Tarzan's Quest, he got hold of some immortality pills manufactured by a weird cult. In the later Tarzan and 'The Foreign Legion', ERB did a bit of "retconning" and explained that long before that incident, Tarzan had been given prolonged life via a witchdoctor's spell. Unfortunately, all Burroughs's ingenuity couldn't disguise increasingly formulaic writing. The lost cities were almost always sought or stumbled upon by identikit safaris, some of whose number had mercenary motives and two of whose members would usually fall in love. Tarzan himself increasingly became like an extra in his own stories, which often suffered from the fact that a marriage-troubled Burroughs stopped including Jane. 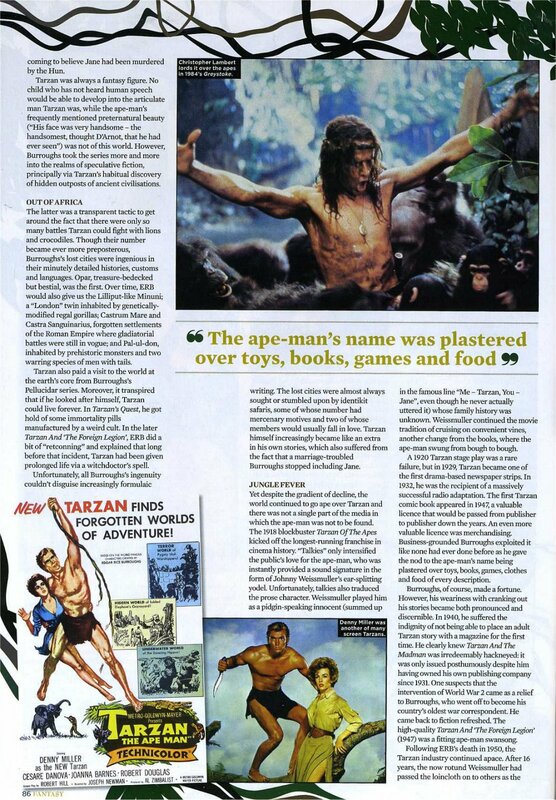 Yet despite gradient of decline, the world continued to go ape over Tarzan and there was not a single part of the media in which the ape-man was not to be found. The 1918 blockbuster Tarzan Of The Apes kicked off the longest-running franchise in cinema history. "Talkies" only intensified the public's love for the ape-man, who was instantly provided a sound signature in the form of Johnny Weissmuller's ear-splitting yodel. Unfortunately, talkies also traduced the prose character. Weissmuller played him a pidgin-speaking innocent (summed up in the famous line "Me - Tarzan, YOu - Jane", even though he never actually uttered it) whose family history was unknown. Weissmuller continued the movie tradition of cruising on convenient vines, another change from the books, where the ape-man swung from bough to bough. A 1920 Tarzan stage play was a rare failure but in 1929, Tarzan became one of the first drama-based newspaper strips. In 1932, he was the recipient of a massively successful radio adaptation. The first Tarzan comic book appeared in 1947, a valuable licence that would be passed from publisher to publisher down the years. An even more valuable licence was merchandising. Business-grounded Burroughs exploited it like none had ever done before as he gave the nod to the ape-man's name being plastered over toys, books, games, clothes and food of every description. Burroughs, of course, made a fortune. However, his weariness with cranking out his stories became both pronounced and discernible. In 1940, he suffered the indignity of not being able to place an adult Tarzan story with a magazine for th e first time. 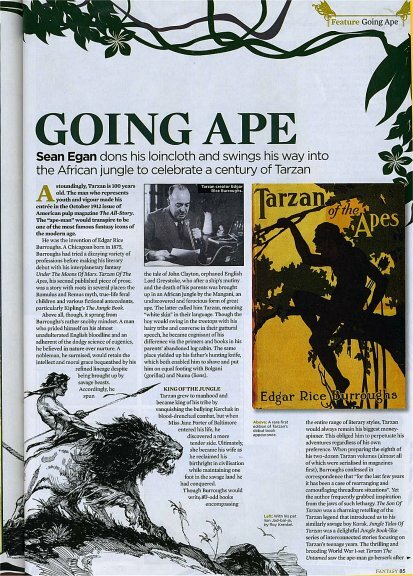 He clearly knew Tarzan and the Madman was irredeemably hackneyed: it was only issued posthumously despite him having owned his own publishing company since 1931. One suspects that the intervention of World War 2 came as a relief to Burroughs, who went off to become his country's oldest war correspondent. He came back to fiction refreshed. The high-quality Tarzan And 'The Foreign Legion' (1947) was a fitting ape-man swansong.